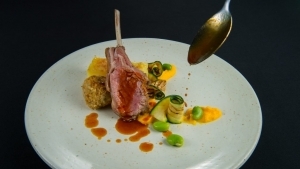 Celebrity chef Stephanie Moon will be returning to host another pop up restaurant series of Sky Dining, bringing a locally sourced spring and autumn inspired menu. Taking Hampshire produce to new heights. Steph will deliver a brand new and delicious seven course tasting menu showcasing the best of Hampshire and Isle of Wight produce. Indulge in a unique fine dining experience, served 100 metres above sea level, surrounded by the Spinnaker Tower’s incredible night-time views. Multi-award winning Stephanie Moon has been a chef for over 20 years, starting her training at the Michelin-starred Dorchester Hotel in Mayfair, London under acclaimed chef Anton Mosimann before working in some of the finest hotels and restaurants across the world, then returning to her Yorkshire roots to become Executive Head Chef at luxury hotel Rudding Park in Harrogate. Steph cemented her celebrity chef status on BBC2’s Great British Menu, representing the North East for three consecutive years on the popular culinary competition. 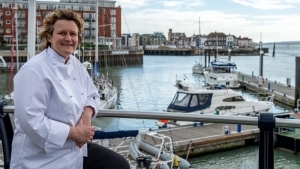 “I am thrilled to come back to Portsmouth for a third year and cook for the visitors to the Emirates Spinnaker Tower. Expect some amazing produce from Hampshire and the Isle of Wight. Those who have been before expect whole new flavours as we are in a different season, it will be a whole new experience. The style and concept of Sky dining is a fun experience, and meant to stimulate conversation along the way. It is really about our guests in the sky enjoying themselves and marvelling at the superb views. Delighted to be working with the team again and looking forward to see how they are going to pair the wine flight with the new season menu.